Having finished with your Integration for Android or iOS, you may now be looking at implementing a Referral Campaign driven by both: Code & Link. AppVirality supports both referral code and referral link to attribute Friend/Referrer. Referral program can be configured with 3 different attribution settings. As mentioned above, the default settings employ Link + Code based attribution for your Referral program. When you set attribution setting to “Link+Referral Code” it will enable users to get attributed and rewarded based on both: Referral Link and Referral Code. In this case attribution may happen itself right after launching the app and hence submitting referral code after that will do nothing, so before prompting the user to enter referral code use appVirality.isAttributionConfirmed() to know the attribution status. If attribution has already been confirmed do not show the option to enter referral code, also don’t submit the referral code to AppVirality. 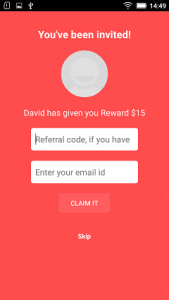 User may install the App directly and enter his friend’s referral code. NOTE: Rewards will be processed in all the cases. Read up on Device Fingerprinting to get a full understanding of how this sort of installation attribution works. This method is considered to be 99% accurate. AppVirality improves this accuracy by taking advantage of Google Install Referrer on Android and SFSafariViewController cookie support on iOS. AppVirality indexes a Click ID in Share URL, which is returned back by the Google Install Referrer on App’s first launch. Friend Clicks on the referral link, which redirects to Play Store or Appstore based on Friend’s device OS. Friend installs the App and launches for the first time. AppVirality uses device finger printing and Google Install Referrer(for Android) or SFSafariViewController( for iOS) to attribute the friend’s install to the genuine referrer, thereafter processing the rewards based on the reward rules. NOTE: Attribution and Reward processing will happen only based on Link attribution. AppVirality supports referral code, wherein a user installs the App and enters their friend’s referral code during signup. Even though attribution method may be set to “Only Referral Code”, there are two possibilities. AppVirality uses generic device finger printing technology to attribute the users primarily if friend installs the App by clicking on referral link. But rewards will not be processed. Once user enters his friend’s referral code, AppVirality verifies previously performed attribution(with device finger printing and deep link) and makes changes to the attribution based on entered referral code, followed by processing of the rewards. Rewards will be processed based on reward rules and conversion events declared in the campaign. NOTE: Rewards will not be processed until user enters his friend’s referral code. Use Email ID of users to Initialize the SDK, everytime! It is highly recommended that you use the User’s email ID for initializing the SDK every time. This will ensure that the user’s Referral Code & Invitation Link remains the same, regardless of the device he logs into. To elaborate this, when a new user acts on the Invite Link and installs the app – it is a convention nowadays to pre-fetch and populate the Referral Code of the Referrer in the Friend’s device during the onboarding, ideally during the Welcome Screen. This can be done after the Integration is finished, in the following manner. Instead of user entering his friend’s referral code manually, you can auto populate the same. So immediately on the 1st app launch of the app on the friend’s device, it is expected that you have initialized the SDK. Referrer Code is available in Init callback.i.e. in referrerDetails. Once, as stated above, the Referral Code is entered, you would need to feed it back to AppVirality to close the loop on the attribution process. If not done, no rewards would be processed for the entire activity. This will be most useful if the user is not attributed using Deep link(due to network changes/IP changes) or if user installs the App directly without clicking on referral link. You need to use this method only if the attribution has not happened already using the Referral Link and user has to enter the referrer’s referral code to get attributed to him. AppVirality generates user referral code as soon as user requests for a campaign. The referral code depends on the campaign that user interested to participate. Referral code is nothing but the campaign participation ID. This gets generated when AppVirality receives a request for campaign, from a user for the first time.